It is not often when your expectations are exceeded to the extent mine were in the preparation of this book. Our heartfelt thanks to everyone at CorporateHistory.net for your great efforts and creativeness. Your earnestness and professionalism are of the highest order, and your warmth and interest in our story are genuine. Reliving the events and activities of PARC’s history has fueled us and cheered us. On behalf of the Airmen of the 380th Air Expeditionary Wing, thank you for your work in preserving our shared legacy. When Plattsburgh Air Force Base closed in 1995, consultants predicted that economic redevelopment would take 25 years. But they underestimated the will of New York’s North Country to recover and the ability of the Plattsburgh Airbase Redevelopment Corporation (PARC) to get the job done. Thirteen years after closure, the former base became home to businesses, nonprofits, residential neighborhoods, community college facilities, and a sparkling new international airport. The transformation was far from easy, however. This case study candidly explores the process, the politics, the personalities, and the sheer persistence that has led PARC to be cited as a national model for military base reuse. 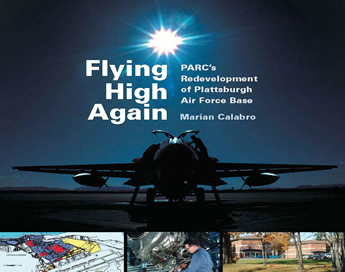 Based on extensive research and in-depth interviews with 60 people closely involved in the process — including federal, state, and local officials; Air Force personnel; and PARC’s successive leaders — Flying High Again is an enduring chronicle for the people of the region and a useful “lessons learned” guide for other base closure communities. We also created a PARC video, “Life After Base Closure,” that has garnered more than 5,000 views on CorporateHistory.net’s YouTube channel. 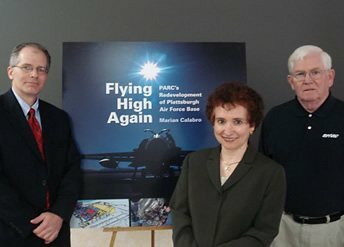 Award Winner: Flying High Again won a 2009 Apex Award of Excellence for custom publishing. Apex Awards are based on the quality of their graphic design, editorial content, and communications excellence. The competition drew almost 4,000 entries. Flying High Again also placed as a National Finalist in the IABC 2009 Gold Quill Awards, Publication Design category. A photo of an FB-111A at Plattsburgh AFB in 1983 provided the perfect cover art. Because the image came from the U.S. Department of Defense and is in the public domain, usage was free—a boon to PARC’s nonprofit budget. Marian Calabro with PARC executives Bruce Steadman (left) and Dennis Doyle at the book launch.